We are very pleased to announce our new site launch today, mobile friendly, easier navigation. We hope you have a good experience, please Like us using the social network of your choice! 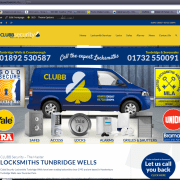 https://www.clubbsecurity.co.uk/wp-content/uploads/clubb-new-website.png 873 1600 Clubb Security https://www.clubbsecurity.co.uk/wp-content/uploads/header-logo-340x156.png Clubb Security2014-05-28 22:14:412014-05-28 22:14:41Our New Website Launches!